Home Basketball Tomic: "Winning the first two in Istanbul is our goal"
Tomic: "Winning the first two in Istanbul is our goal"
The pivot believes that the tie against the Turkish side will be matched and confident to qualify for the Final Four. 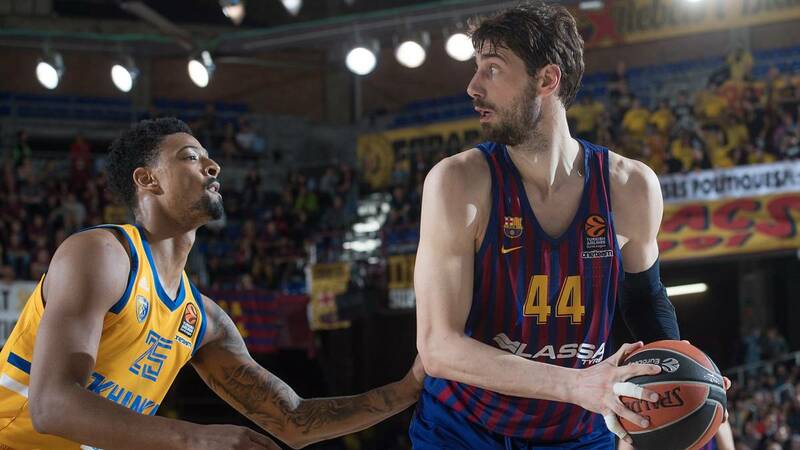 The captain of Barça Lassa, Ante Tomic, describes the Euroleague quarterfinal tie against Anadolu Efes as "equalized" , although he expects the Catalans to impose their game to "try to win the first two games" in Istanbul. The Barça players measure themselves against Anadolu with the lead factor against them. The first two games are played this Wednesday and next Friday on Turkish track: " It will be a very balanced series, since in the two games we have played against them we have seen several different elements, many tactics, many high-speed and in the recent games of Endesa League we have not been thinking much about Efes ", insisted the Croatian. Tomic believes that the last two Barça victories in the Endesa League away from home have been "very important" to gain confidence before these two upcoming commitments: " I think both games will be super difficult and for us it is very important to be back in the 'play off' after several years away from them and it's a great opportunity to reach the' Final Four ', but we know it's a very complicated series, "he insisted. The Barça captain acknowledged that this season the Turks are "very, very good", especially in attack, as they have players " with many points in their hands" and their basketball has "a lot of rhythm" . It considers that it is a "very balanced" team, since it has "good shooters" and also "very strong people in the inner game". Tomic faces his fifth quarterfinal tie as Barça and in the previous four only two agreed to the Final Four (2012-13 and 2013-14). The fact of being captain for the first time in a tie does not represent anything special for him. "My role does not change much, if we win the Euroleague, it changes everything, but at this moment no. I am totally focused on Wednesday's game and not thinking about being the captain," he argued. Recover the defense that Saturday the team did not show in Zaragoza, despite the victory (86-91) is vital for Tomic because, in the last two games away from home, the team of Svetislav Pesic has suffered, especially in the beginning of the match by yielding many points in transition. " It is very important to have a technician from Pesic's experience on the bench, because he has won almost everything and this is a plus for his team," he said. Singleton: "It will be a very hard playoff but I have confidence to be able to overcome it "
American power forward Chris Singleton, one of Barça Lassa's key players in the Euroleague quarterfinal tie against Anadolu Efes, believes that the tie against the Turkish side will be" a "play off 'very intense and hard ", but was confident to overcome it. "The team arrives at a good time, although we have to improve some things." We come back to a tie after several years of not being in it and we all have the maximum enthusiasm to be able to move forward, "he added. Regarding the approach of the tie, Singleton said that Svetislav Pesic has not prepared anything different from the usual: "A our coach does not like special things, just focus on defense, in the 'one against one' , in the maximum contribution that everyone can do, if we do not do it well we will not have the chance to overcome it "
One of the claves to be able to beat the Efes is, according to the North American player, " the 'blockade and continuation', the individual defense and also avoid that his bases Larkin and Micic have control of the game. " Singleton has played all the games of the regular phase and only one was not in the initial five. Although his average 8 points seems small, his rebounding ability (4.2 sacks per game) and defense provision make him irreplaceable. It will be his fourth presence in a quarterfinal tie. In the first, in the 2015-16 season with Lokomotiv Kuban was the executioner of Barça, which eliminated (3-2), falling in the semifinals of the 'Final Four' against CSKA Moscow (81-88). In this sense, he does not believe that the track factor is determinant because, "a match is different and with two teams so equal, anyone can win on the other track". " We arrived prepared and, in addition, there is a lot of union and desire in the team", sentenced Chris Singleton.